A small-time hood (Robert Mitchum) facing two years in prison provides information to a federal detective (Richard Jordan) in exchange for amnesty. Based on a novel by district attorney George V. Higgins, Peter Yates’ gritty thriller effectively showcases Boston’s criminal underbelly in the early 1970s. 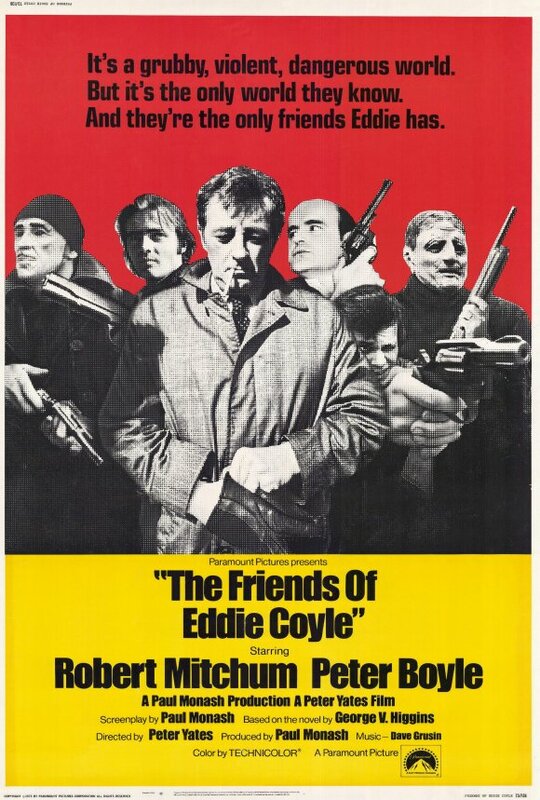 The film’s title is an ironic misnomer, since the “friends” of Eddie Coyle (Mitchum) are anything but; indeed, they exemplify the adage that there’s no honor among thieves: when it comes to self-preservation, loyalty goes out the window for these petty gangsters. By the movie’s final powerful shot, we realize that crime truly doesn’t pay, and that there can be no such thing as a happy ending for people whose survival hinges on tenuous trust. Eddie Coyle features marvelous performances by each of its male leads — including Steven Keats as an edgy gun-runner, Richard Jordan as a wily federal detective who fully realizes that he holds Coyle’s future in his hands, and an appropriately brittle Mitchum as the eponymous protagonist. Unfortunately, we learn far too little about Coyle himself — an intriguing character who merits much more attention. Instead, Yates spends an enormous amount of screen time showing us a couple of bank heists, which are well-executed but ultimately gratuitous, given that they don’t further the plot in any way. Despites its flaws, however, Eddie Coyle remains an interesting entry in Mitchum’s late-life career, and is certainly a must for fans of this iconoclastic actor. No. While Peary lists it as a Sleeper and a Personal Recommendation in the back of his book, The Friends of Eddie Coyle is ultimately only most-see viewing for fans of Mitchum. Though director Yates does not have an overwhelmingly distinguished career, ‘The Friends of Eddie Coyle’ is, I think, a film waiting to be re-discovered. The less known about it in advance, the better. It has a documentary feel, precise attention to detail and clever construction – for those reasons and others, multiple viewings will pay off. Mitchum turns in a very modulated performance; this is loner territory, and I guess I feel – well, whatever we don’t know about him, we can fill in our own blanks. This almost feels like a Sidney Lumet film – the bank robbery sequences may put one in mind of ‘Dog Day Afternoon’. Yates has a similar understanding of tension. Most of this film is extremely tense, but certain sequences are almost unbearable.